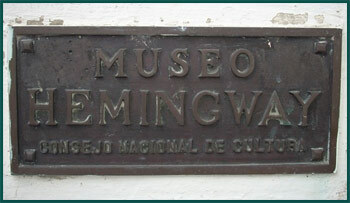 "Museo Hemingway at Finca La Vigía"
Plaque commemorating the Museo Hemingway - located at his house in Cuba named Finca Vigia. The Hemingway House in Cuba is located in a small, modest suburb of Havana named San Francisco de Paula - approximately 9 miles from the capital city. Situated on a hilltop, the Hemingway House was first purchased by Ernest Hemingway in 1940. Expect occaisional closures - usually attributed to renovations. Finca Vigia and the Hemingway Museum are located in the town of San Francisco de Paula. Follow Carretera Central from Havana for 9 miles.